for this Carlsbad pool equipment upgrade, we were contacted by the general contractor. This was the company performing all of the other upgrades to this home in Carlsbad, CA. They were looking for a licensed pool contractor to install some new pool equipment once the plumbing and electrical were relocated. The existing and new pool equipment was going to be moved to the other side of the home. 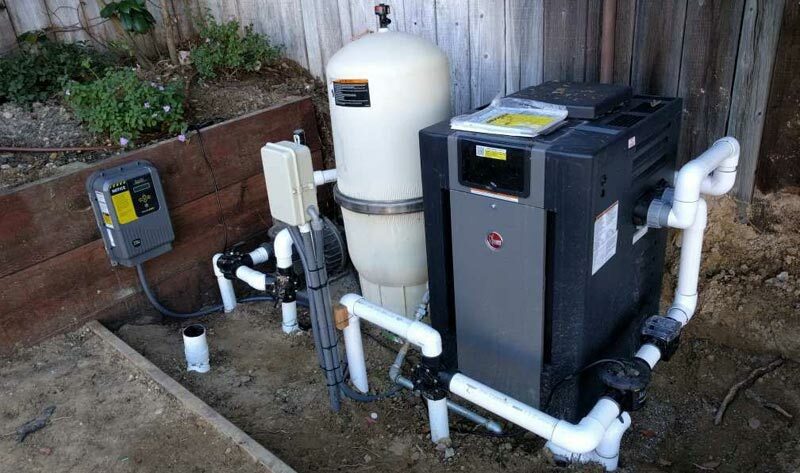 Along with moving the existing pool pump, the also wanted to install a new pool heater, Time clock and to install a saltwater chlorine generator. This pool equipment relocation also needed all new pool plumbing that included a new check valve and three-way Jandy valves. Below explains the work that was performed, the equipment that was used and what pool equipment upgrades were made. When quoting to replace the pool heater for this pool equipment relocation, we highly recommended a Raypak pool heater. This specific pool heater (Raypak 406a residential pool heater) is the one we recommend 90% of the time. Unless there is an issue with available space or customers specific request the Raypak pool heater is the way to go. It was also a no-brainer to offer this heater as the pool equipment was being relocated and there was plenty of available space for the installation. Other pool heaters are OK but, we know that this Carlsbad Raypak pool heater installation will hold up to the elements and likely last longer than other pool heaters. When space constraints are an issue is when we would recommend a different pool heater that has a smaller footprint. These are pool heaters like the Pentair MasterTemp or Sta-Rite Maxi-Therm Pool Heater. This swimming pool in Carlsbad did not originally have a saltwater pool system. Because they were redoing their pool equipment area and backyard they were wanting to upgrade to a saltwater pool. We installed a Jandy TruClear saltwater pool system due to its cost, quality, and Ease of use. Unless you have any specific pool automation installed in your pool, and you want to keep everything the same. Nowadays, most pool equipment installed is compatible though some people want to use the same manufacturer’s equipment. There are many variations of the saltwater chlorinator. The Pentair IntelliChlor is often used by pool owners that have a Pentair IntelliTouch or Pentair EasyTouch as they sync well together. The only problem is that the replacement salt cells are rather expensive. Due to salt cells needing to be replaced every three or so years means that we want to provide customers with a less expensive option. There are also the quarterly or every three months salt cell cleanings and the Jandy TruClear is very easy to clean. With this Carlsbad salt chlorine system installation, we always emphasize proper water chemistry. Saltwater pools need to have a professional weekly pool service company or the homeowner needs to check and balance the water’s chemistry. This needs to be done every week at the minimum to ensure the saltwater pool does not cause issues. Saltwater chlorine systems are a great addition and we do recommend them a lot of the time based on the usage of the swimming pool. As the existing pool pump and pool filter were in good condition, the pool owner was not interested in replacing them at this time. We did recommend that they replace the single speed pool pump with a new energy efficient pool pump but, they were wanting to wait a while. The existing single speed pool pump is not very energy efficient though it was in good working condition. The pool filter was also in good condition. The pool filter is a Pentair FNS pool filter and was only required to have a pool filter clean performed. This pool equipment upgrade and relocation went smooth as the general contractor and homeowner were very organized and prepared for when we came to perform the pool equipment installation. The pool owner is also very happy to have freed up some space in the backyard by moving the pool equipment. They are also very happy that they no longer hear when the pool equipment is running. That is because the pool equipment installation was done on the opposite side of the home well away from the entertaining area. If you live in Carlsbad or any other area of San Diego County, we can help. We provide professional pool equipment repairs, pool equipment installation along with other pool services. We are a licensed pool contractor that are happy to answer any questions or concerns and schedule any work that is needed. Please feel free to contact us via phone or our contact form.